Let’s start with an easy, vegan, gluten-free recipe and then I’ll share my writing process with you. The base of this Millet Mung ‘pudding’ is really simple to make. And, once the base it done you can dress it up in whatever creative ‘dessert-y’ way you like – nuts, chocolate sauce, berries – think of it like a vanilla ice-cream that you can customise with toppings of your choice! The millets I used for this recipe were from a batch of mixed millets that I had. Feel free to use any variety of millet to make your version of this ‘pudding’. Millets have a medium to high GI but have a lot more fibre and iron than rice. I’ve added mung bean (low GI) to this recipe to lower the overall glycemic load so as to not spike blood sugar levels. 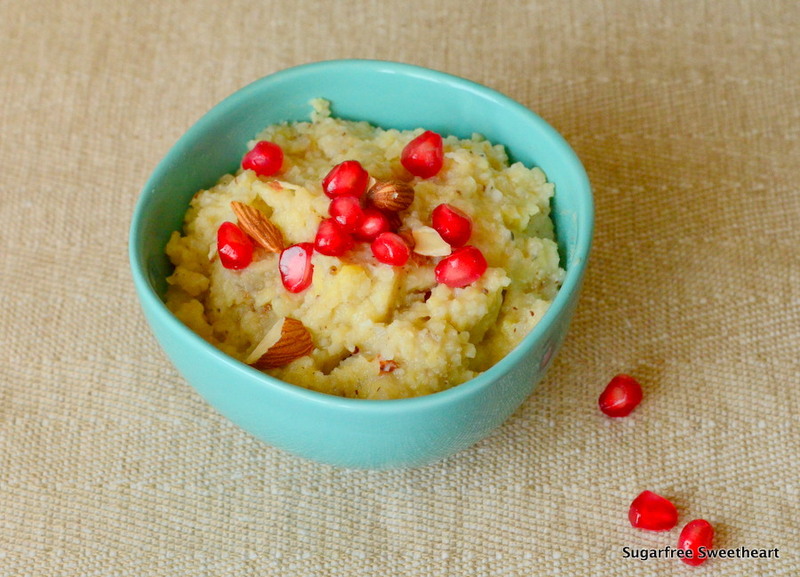 This recipe is suitable for diabetics, millet maniacs, and savourers of simple fare. I’ve tried cooking the millets and mung in the pressure cooker and somehow the resultant mixture is too stodgy to use in this pudding. And so I’ve opted for cooking in a saucepan. If you are new to millets or mung dal, do start out with at least 3 cups of water per cup of each and watch the cooking. You may have to try out a couple of different ratios to find the sweet spot of cooked, yet fluffy, or not (if you prefer). If you don’t have access to millets, try this recipe with brown rice instead. For a comprehensive guide on how to cook brown rice, check out Apsara’s post here. Add stevia extract to your pudding if you’d like it sweeter. I was invited to be a part of this interesting ‘tour’ across the blogosphere by Pavithra from Eat, Live, Burp and also by Deepa from Deelightfully Veg. Thanks for thinking of me! Before I begin all about me, me, me for this tour, let me urge you to take a look at these blogs. Eat, Live, Burp is a neat, well-articulated, vegetarian blog (with vegan recipes too) and simple, cute photography that often makes me hungry! Pavithra is super kind and easy to get along with – so go say hello! 🙂 Click here to see what she got me when we met last year! Deelightfully Veg is another vegetarian blog with a variety of recipes both healthy and indulgent as well as restaurant reviews. Do click through to say hello to the cook, Deepa! I have been trying to put together a cookbook based on the recipes on my blog and others I make regularly. However, there has been a bit of a change in plans. I’m going to do a separate post on my ‘revised’ plan of action.. so more then! You know this already, yes? Diabetic-friendly food. Illustrated recipes. Occasional bits of chit-chat. And that’s it! I started blogging because I wanted to share what I had learned about cooking diabetic-friendly food through trial and error in the kitchen. I was unable to find good blogs that were dedicated to this kind of diet, so I thought that if even a few people were helped along by what I shared then it would be a satisfying experience for me. Right from the beginning I knew that I wanted to present my recipes in a way that was easy to understand and grasp even by novice cooks as I myself was at the time and kinda still am today. And so I settled on illustrations. It meant more work and less frequent posts but I decided to go for it anyway because I wanted my work to be as accessible as possible for all types of cooks out there. I also thought it would make it more fun for the readers. Once I have decided that a recipe is worth sharing, I make sure I get a good photograph and I write down all the ingredients, quantities, and notes for making the dish. I then create the illustration (sometimes scanning new artwork, other times using earlier scans), and work on colouring and text in Adobe Photoshop CS5. As for the written bits, I just sit down with a blank post template and type away, trying to include any interesting facts about the recipe, or its ingredients, or my experience cooking or eating the dish. I try to keep it as short as possible because I think people are more likely to read it that way! I love both their writing styles and thoroughly enjoy reading their blogs. I’m nominating Aimee and Sofia, hoping to learn about what goes on in their heads before they create their fascinating, thoughtful, and engrossing posts! What a lovely looking pudding, I have never thought of a sweet dish with millets. ‘Millet maniac’ makes me laugh! Thank you for linking my brown rice post. 🙂 You are doing great service through your blog, Priya, here’s to many more lovely posts and beautiful illustrations/videos. This is the most beautiful illustration to the date. The backdrop and color combinations are wow. Such a neat recipe to share. Millet though high on carbs is very very rich in iron, folate and other nutrients. 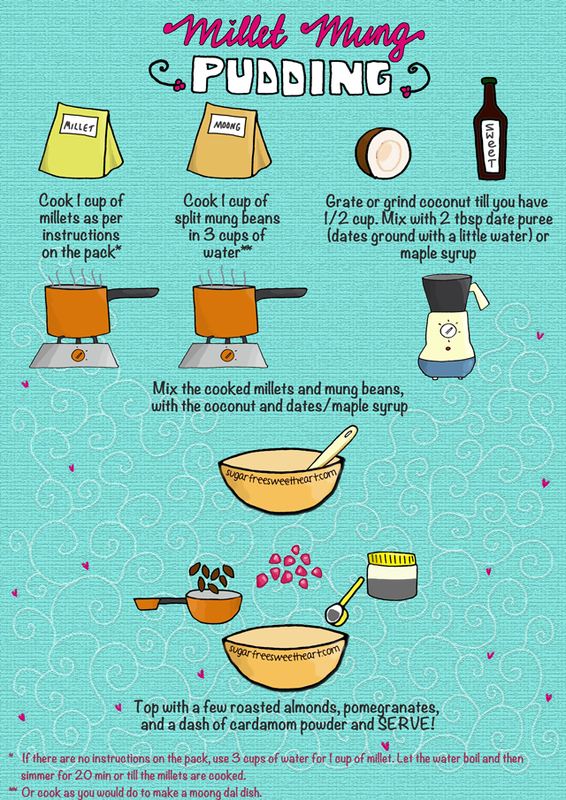 What a great way to balance a recipe with mung. Great work in creating this recipe. Very well written blogging your! The illustrations and the purpose of your blog makes it stand out and shine bright. It’s my favourite backdrop so far, too! Just happened to turn out the way I wanted without even trying too hard – I guess that’s how it works! 🙂 And thanks for your constant support, Sonal! Wow! Mung beans in a sweet dish – I would never have even considered it! What a clever lady you are. Ha ha, thank you! Mung is so mild in flavour that it really can take on the sweet flavour of a dessert. Thanks so much for your generous comments, Sofia! Made my day! 🙂 As I said in the post, I really look forward to reading your answers!